I really thought we were done in the sunroom! The recent makeover is still one of my favorites and added so much beautiful character in this room. The addition of the farmhouse floors gives it cottage appeal. As summer approached and we found ourselves anticipating the arrival of our oldest son and other family, we realized we needed to do something about the bedding situation in our home! We live in a home that's about 2800 sq feet...certainly not small by any means! But we only have 3 bedrooms. The bedrooms are all huge, but that doesn't help when you need more of them! That led us to the decision to purchase a daybed for the sunroom...extra sleeping. 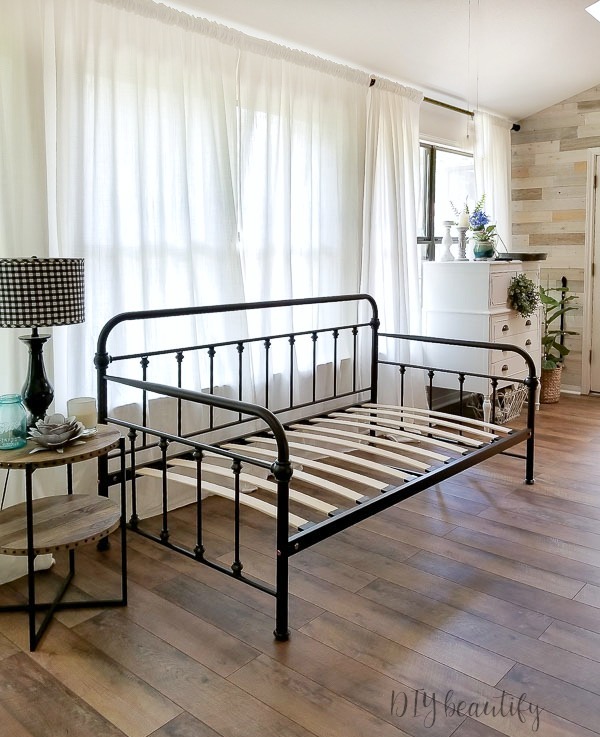 After scouring the internet for a great deal on a vintage-looking iron daybed, I purchased this one. It had all that vintage charm that I was looking for! It arrived quickly and my son and daughter set it up for me...because my back! It's sturdy, well-made and looks like an antique with those gorgeous spindles! I could have purchased the same bed with a trundle, for even more guests. Here's how it looked before the mattress arrived. I found a memory foam twin mattress at Costco and new vintage striped sheets from Target. I didn't want the bed to look like a bed! It will function as a sofa most of the time, so I dressed it with a king size white cotton quilt, and then layered on a ton of pillows. The new daybed fits the space nicely, and I can't wait for colder weather so I can snuggle up in front of a roaring fire! This pretty daybed is charming, spacious and extremely comfortable! Give me a stack of magazines and endless snacks and I will never leave this spot! In fact, next time Mr DIY snores, this is where I'll be! In keeping with the cottage theme in this room, I want to paint my rocking chair either white or blue. I already have the cottage white dresser, and lots of black in the space so I'm leaning towards a light blue. What do you think?